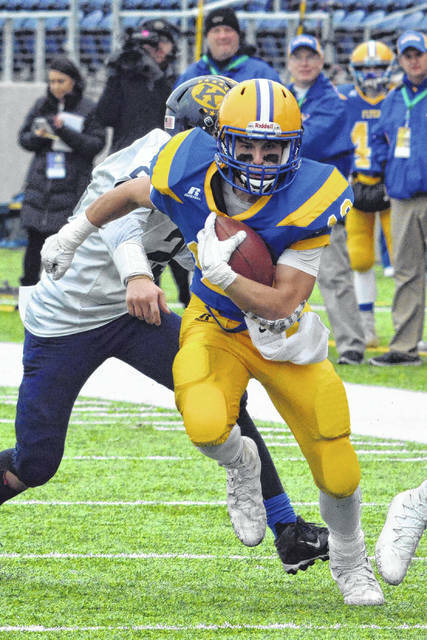 Marion Local’s Nolan Habodasz finds running room during Saturday’s Division VI championship game against Kirtland at Tom Benson Hall of Fame Stadium. 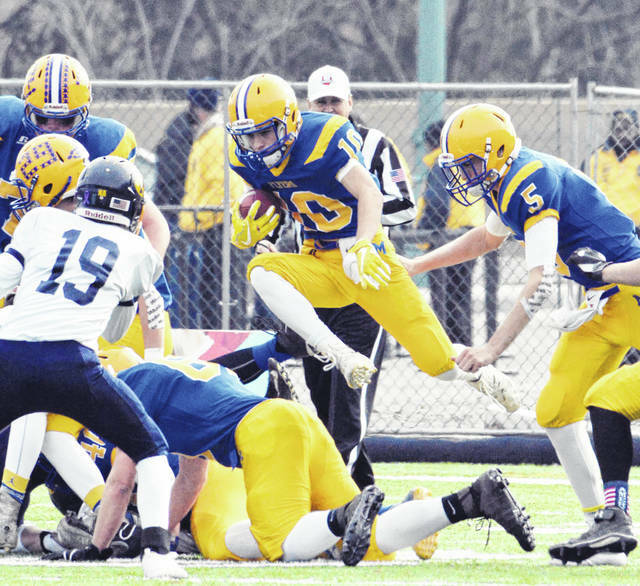 Marion Local’s Matt Rethman goes airborne during Saturday’s Division VI championship game against Kirtland at Tom Benson Hall of Fame Stadium. CANTON — Top-ranked Marion Local (15-0) won its 10th football state title in school history and sixth in the last seven years Saturday morning with a 34-11 win against No. 2 Kirtland (14-1) in the Division VI state championship game at Tom Benson Hall of Fame Stadium. The Flyers are one behind Cleveland St. Ignatius for the most all-time state football crowns. Marion Local junior quarterback Nathan Bruns was 10-for-15 passing for 178 yards and two touchdowns. Teammate junior Nick Tangeman finished with six receptions for 120 yards and a touchdown. Flyers running backs senior Jack Buening, senior Alex Partington and junior Nolan Habodasz all scored rushing touchdowns for the Flyers and combined for a total of 123 rushing yards. The Flyers outgained Kirtland 331-184 in total yards. Kirtland took the opening kickoff and drove 51 yards in 14 plays to the Marion Local 15-yard line. Senior Dylan Aquila converted on a 33-yard field goal to give the Hornets a 3-0 lead with 5:18 remaining in the first quarter. Kirtland then forced a three-and-out on Marion Local’s first possession, but the Hornets gave the ball back to the Flyers on a fumbled punt return at their own 40-yd line. Marion Local capitalized on the Kirtland turnover and took the lead for good on a one-yard touchdown run by Habodasz. The two-point conversion run by Habodasz was good, and the Flyers led 8-3 with 1:05 left in the first quarter. Marion Local added to its lead with 9:30 remaining in the first half. Bruns completed a 10-yard touchdown pass to Tangeman, however, the PAT was blocked, and the Flyers’ lead was 14-3. After forcing a Kirtland punt, Marion Local put together an 11-play, 80-yard touchdown drive highlighted by a 31-yard pass from Bruns to Tangeman down to the Kirtland 14-yard line. Three plays later, Buening scored from 3-yards out to bring the Flyers’ lead to 20-3 at the half. Marion Local took the opening kickoff of the second half and went on a 12-play, 59-yard drive, capped by a 20-yard touchdown pass from Bruns to Tangeman, bringing the Marion Local lead to 27-3 with 7:19 remaining in the third quarter. A 1-yard touchdown run by Alex Partington completed the Flyer scoring with 11:30 remaining in the game and a 34-3 lead. Kirtland scored with 2:29 remaining in the game on a 6-yard touchdown pass from senior quarterback Dylan Fulco to Joey Torok, and the two-point conversion run by Mike Zeuli was successful, bringing the final score to 34-11. Kirtland running backs Jake Neibecker and Torok, both juniors, combined for 130 rushing yards on 27 carries. Fulco finished 7-of-9 passing for 57 yards and a touchdown. 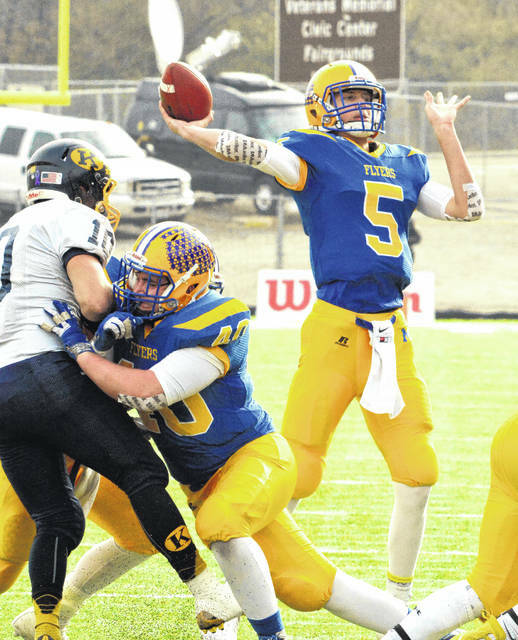 Kirtland was making its sixth state championship game appearance in seven years. It’s the Hornets’ third state runner-up finish in football with the others coming in 2014 and 2012. Kirtland won state titles in 2015, 2013 and 2011. Attendance for the game was 8,062.
https://www.limaohio.com/wp-content/uploads/sites/54/2017/12/web1_ml048.jpgMarion Local’s Nolan Habodasz finds running room during Saturday’s Division VI championship game against Kirtland at Tom Benson Hall of Fame Stadium. https://www.limaohio.com/wp-content/uploads/sites/54/2017/12/web1_ml024.jpgMarion Local’s Matt Rethman goes airborne during Saturday’s Division VI championship game against Kirtland at Tom Benson Hall of Fame Stadium.